There's this old joke in the yoga world that Chaturanga is Sanskrit for shoulder shredder. Yikes! As is true with many things like that, the joke probably sprang from some bit of truth. In so many vinyasa yoga classes this is a posture that is often rushed through, misunderstood and therefore misaligned, and doesn't often get much slow precise attention because of being rushed and misunderstood. I know that certainly was the case for me for a long time. Today I'd like to bring a bit of clarity to the basics of this pose so whether you can do it or not, you have a better understanding of what it is and how to work towards gaining enough strength to do it well. Ignoring any magical connotations (although it can be pretty magical when you can finally do Chaturanga well!) 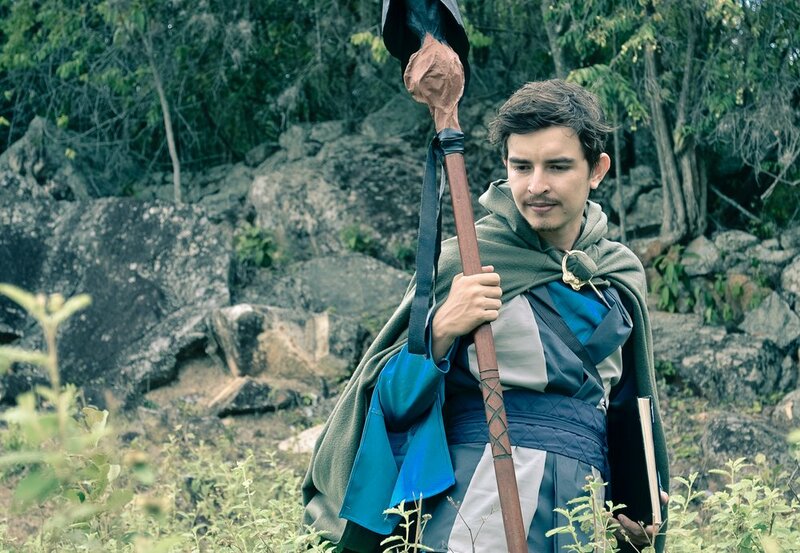 notice that the staff pictured here is long, straight and strong looking. If we leave out our arms for a moment, we can translate that into the pose and our body by thinking of it as long and straight like a staff. Remind you of anything? Yep. Plank pose. 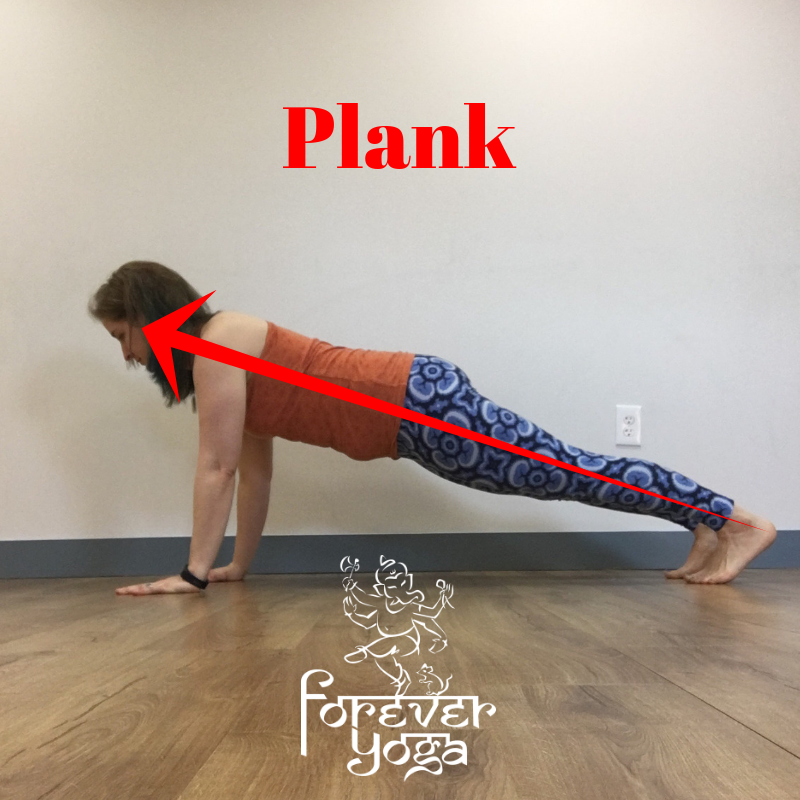 Plank pose is mostly commonly the pose we're in before we attempt Chaturanga. Our plank pose needs to be strong and well aligned first. Notice in the picture above that there is a very distinctive straight line from the heels right up through the crown of the head. 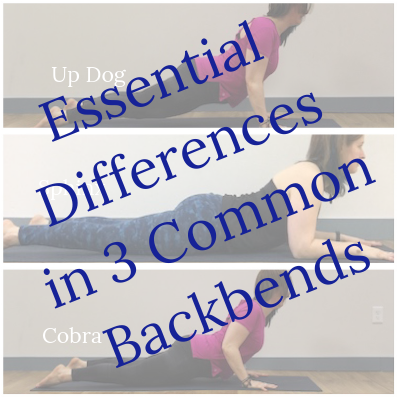 Sometimes we refer to plank as a high pushup and Chaturanga as a low pushup. 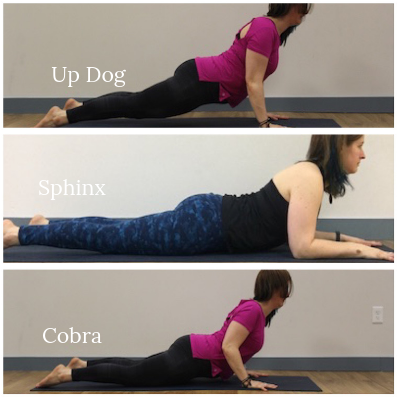 But here's the catch - your belly/hips should not touch the floor in Chaturanga. By all appearances, to move from plank to Chaturanga you simply bend your arms and lower part way to the floor. (That isn't actually true by the way. The transition between plank and Chaturanga is another topic which I'm happy to write about if there's interest. Let me know in the comments!) The four limbs (or really your hands and the balls of your feet) should be the only things touching the floor. And if you're really lucky, your photographer is quick with the shutter! Easier said than done! If you've ever tried it you probably know that stopping before you hit the ground is incredibly difficult. At least until you've gained the strength needed to do so. It's also really important for the shoulders that they don't fall below the elbows. You can see that pretty clearly in the image above. The muscles of the shoulder girdle need to be strong enough to keep the shoulder joint stable while it holds the weight of the body off the floor. That's probably how that old joke got started. So how can we build the strength we need to do this posture well? - Locust pose: With the belly down on the mat the back body muscles MUST fire in order to lift the limbs. We've also been including some breast strokes to increase the challenge of this back body strengthening posture. - Mini push ups with the knees down: Without the strength to do the posture well, the shoulders can be put under undue strain and stress. Here we take the weight of the body out of the equation to focus on alignment of the shoulders and arms and to build upper body strength to sustain the pose. - Forearm plank: To me, this pose can feel like an all-over workout! Your core is supporting the spine, the legs are strongly helping to activate the core and the shoulder girdle and upper body are sustaining the weight of your body. This is also nice if you have any pain in your wrists; you can take them right out of service and still gain strength. If you find you struggle with poor posture throughout the day, strengthening the core and the back body line will allow your posture to improve as well. There are many other aspects of this posture that are important to understand but beyond the scope of this blog post. If you'd like even more clarity around this pose, be sure to sign up or join the waiting list for my Yoga Fundamentals: Shoulders & Chaturanga workshop coming up this month or schedule a private lesson with me for even more individual attention! If you have specific questions, I'd love to hear them! Leave a comment below. I wish you strong stable shoulders!